Dances donning a top hat and cane. Burning Crusade Collector's Edition required. 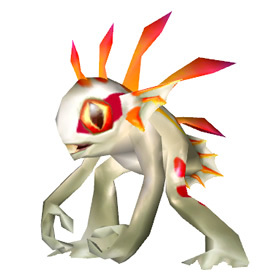 *This pet was offered as compensation for an error (which was later corrected) that prevented EU Burning Crusade Collector's Edition owners from receiving their Netherwhelp pets. I can confirm that Blizzard is not giving out this pet any more. I recently (July 2018) went throught the TBC:CE activation process and Blizzard support sent a seperate email stating that Lurky could not be given to me as it was only available for a limited time. Pity. I bought a ce a while ago, and sent the deatils to france. But i only got Netherwhelp sent me. Guess they a misstake in france. Im on a Eu server to.. I contacted a GM but they refuse to do anything about it. so sad right now, update. Two different Gms told me now that Lurky is no longer available. Dispite the comment below me i still had to send in the barcode with a card from the tcg deck to france. They did sort it really quick i send it 2 days ago and just now a gm contacted me it was sorted and pets be in mail if i restarted wow. This pet IS still available, as of November 2014! I added the code to my Battlenet account today and when I logged in BOTH the Netherwhelp and Lurky were waiting in my mailbox. It looks like they have finally fully automated it so no more having to post things to France. You can still get Lurky. I sent my mail 2 days before xmas and received both Lurky and netherwhelp today. I bought the CE on Ebay. You can't upgrade your account to CE through battle.net so you need to send a couple of things to France (EU). I had already thrown away the paper on the backside of the CE but luckily I managed to find it (stuck between an old diaper and some iceberg lettuce). As of 5.0.4. they ruined Lurky's cute little voice imho and replaced it with a more sharp sounding, monkey-like one. It's still my favourite pet though! If I owned this cute little guy he would be out running with me all the time! I want one. I have deathy put its not the same. In fact, the error seems to have never been corrected (luckily for us). I bought a brand new BC Collector's Edition a week ago, as it was available for a discount to those who pre-ordered Cataclysm CE in Russia and other countries. That was still with the error, but after sending a proof of purchase to the support, I now have both the drake and this great pet! Got it today, so if you buy BC:CE, still can get him. Unfortunately because you can buy EU special edition still on Ebay etc., I doubt Blizzard will ever "even out" the field by letting us U.S. collectors at this pet. Lurky's charming disposition and lively antics are guaranteed to soothe frustration and lighten even the darkest moods.